Our company’s founder, Bobby Mitchell, was on a mission. With years of fine dining experience under his belt – as a successful restaurateur and as a chef at one of the best steakhouses in the country – it was time for a change. Bobby took what he learned from his fine dining experience, combined that with his love of juicy burgers and that’s how Juicy Burgers and More was born in 2008. Because our burgers are cooked in our specially designed 1800 degree over-fired broiler, you get a juicy burger EVERY TIME. With our signature Build A Burger options, you can customize your burger with a variety of toppings. Not sure what the hype is all about? 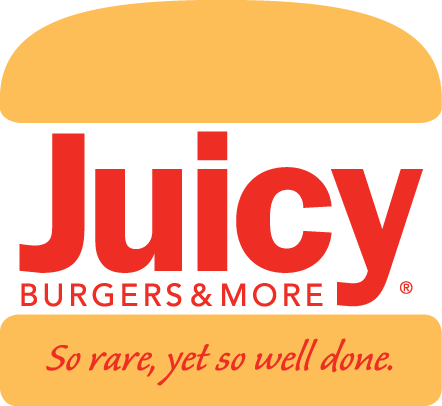 Here’s what #EatJuicyBurgers lovers have to say . . . Went here for the first time. It was very good. I had a grilled chicken breast with lettuce, tomatoes, pickles, roasted red peppers, and pesto. Just 8 bucks! My husband had a burger with cheese, lettuce, tomatoes and pickles. Just 8 bucks! It’s the best hamburger for under 10 bucks. It’s worth checking out. Oh, and you can order on-line for quick pick up!